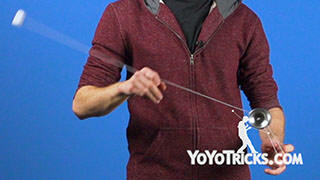 Learn how to do the 5A trick known as Discord. 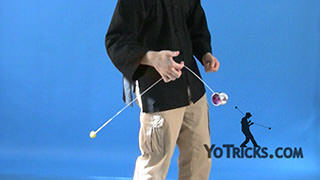 To do Discord, you need to know how to do the one handed undermount, which we teach in our shoulder pop video, basic stall, and reverse bee sting. 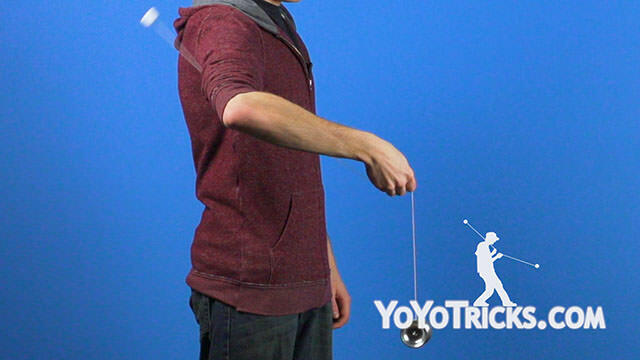 So if you have not learned those tricks yet, you are definitely going to want to check them out before you work on Discord. 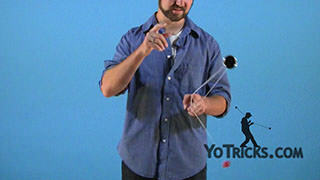 To start this trick, first we throw a breakaway. 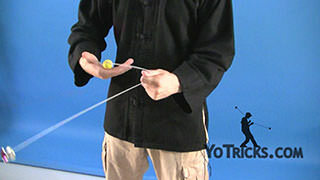 Then we are going to do a trick a lot like a one handed undermount, but instead of catching the counterweight in our throwhand like we usually do, instead we are going to let the counterweight pass in front of our throwhand. 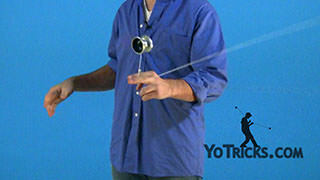 Then we are going to swing the counterweight toward our opposite hand side to stall it. 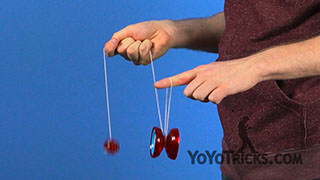 Take our opposite hand and just tap the counterweight. 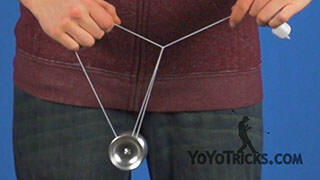 This tap is not strictly necessary, but it just makes the trick look better. 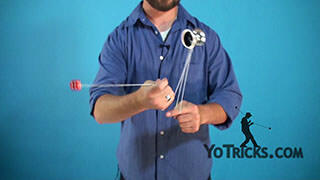 After we have tapped the counterweight, then we need to start swinging the yoyo back toward our throwhand side. 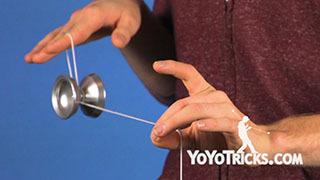 Right when the yoyo is pointing straight down perpendicular to the floor, we want to take our throwhand and pull it straight up, which is going to give the counterweight enough energy to unwrap from the bearing. 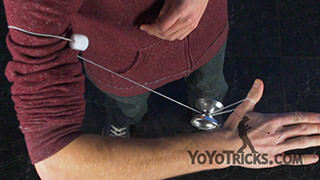 As the counterweight is unwrapping, and as the counterweight reaches this position, about 45 degrees above parallel on your throwhand side, you want to take the yoyo and swing it toward your opposite hand side, and then quickly pull back. 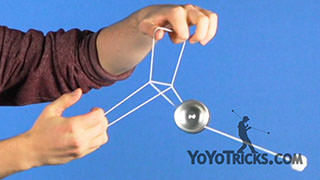 As you do that, the yoyo and the counterweight are going to separate. 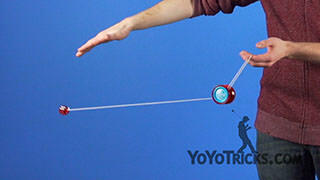 You can pull the yoyo back onto a trapeze around your opposite hand pointer finger. 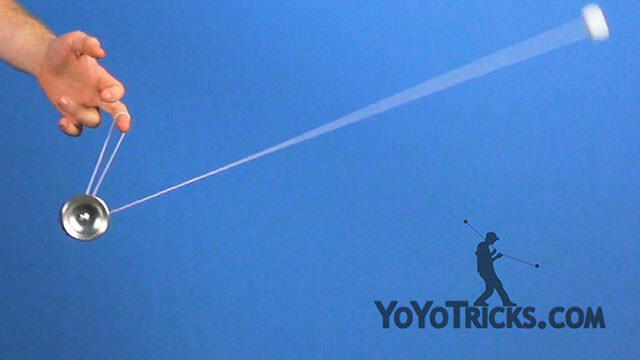 So there is a lot going on there, so let us break it down a little bit more. 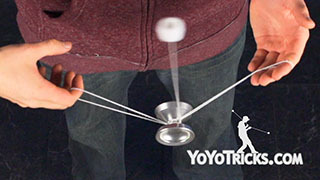 I am going to stall, tap, right when the yoyo reached perpendicular, I am going to pull straight up, push forward, pull back. 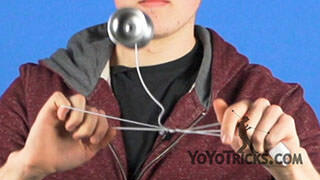 The counterweight is going to separate from the yoyo and then you will see that you are in an Electric Fan variation. 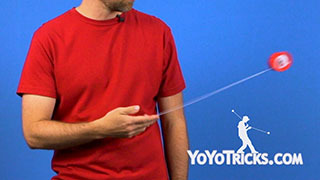 Once you are here, then you want to do a reverse bee sting. 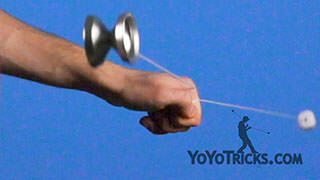 So you are going to hope the yoyo off the trapeze, onto your middle finger. 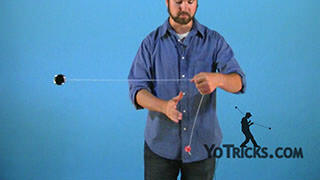 Then right when the counterweight string is in line with this string, you are going to push the yoyo into the bottom of this string and let go of the counterweight string to perform a reverse bee string. 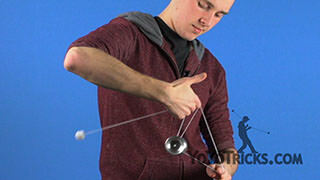 When you are doing this reverse bee sting, just for the timing of the trick, it is really important that you add that extra revolution at the end. 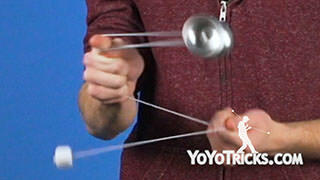 So you do not want to just do the basic variation, where you land it in a trapeze. 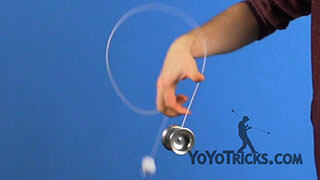 Instead you want that extra revolution. 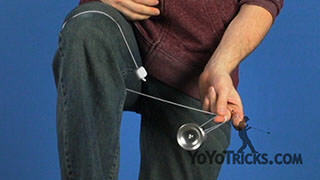 As the yoyo is coming into the trapeze, rather than catching the counterweight in your hand, instead you want to catch the string in your hand. So you are right back where you started. 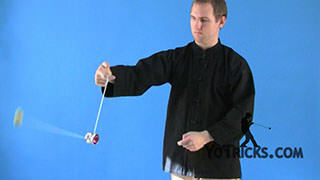 Then from here you can just repeat that reverse bee sting motion as many times as you want. 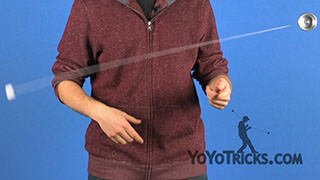 When you are first practicing this reverse bee sting, you might find that the timing is giving you some trouble, so I would recommend just first getting into the e-fan. Finding your string proportions, and then doing it once, setting yourself back up again, and doing it a second time. As your timing improves, you will be able to do it quickly and smoothly. And that is Discord.